Some users have found that the Compatibility Mode may cause parts of Metric Insights, e.g., menus, to appear in the wrong location of the webpage. 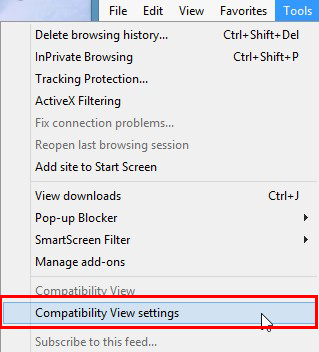 You must turn off Compatibility Mode to view the page correctly. Metric Insights is designed to run on current versions of IE in their standard mode. Please consult Microsoft's knowledge base for detailed instructions on turning the mode off and setting up exceptions. The basic steps are to open the "Tools" menu and then select "Compatibility View Settings." The "Tools" menu can be opened by selecting it from the menu on the top of the window or by clicking the gear (IE 11). Ensure the Metric Insights website is not listed as a site to view in Compatibility Mode. Prev: Need to recover an old version of a Element ? Next: Why didn't my data update when I recollect data?